Koh Phi Phi accommodation varies from the smart and luxurious 5 star 'Zeavola Phi Phi Resort' to the modest and budget 'The Rock Backpacker'. In between these two extremes there there is plenty to choose from for every type of holidaymaker or traveller. Koh Phi Phi accommodation is primarily on Phi Phi Don Island with only the opportunity to stay on Maya Bay Phi Phi Ley Island, by Camping tour (see Maya Bay accommodation location). Phi Phi Don accommodation squeezes on to the main beaches and the main Phi Phi Don Village, as the centre of the island is mountainous and uninhabited. The busiest area for Koh Phi Phi accommodation, Phi Phi Don Village, has over 75% of all rooms in the village or on the connected beachfronts. This is where the ferries arrive in from Phuket, Krabi and Koh Lanta. In between the famous bays of Loh Dalum and Tonsai Bay there are many guesthouses and hotels, whereas along the seafront the resorts command the best views. The other key Koh Phi Phi accommodation is on Long Beach. It has wonderful views out to Phi Phi Ley and a a gorgeous coral reef beyond the long stretch of sand. The main resorts are Phi Phi The Beach Resort, Phi Phi Paradise Pearl Resort and at the budget end, the Phi Phi Hill Resort. Even quieter and more remote you have Pak Nam Beach where the Phi Phi Relax Resort and Tokho Beach Resort let you slip from the worldy and submerge into nature. Luxury Koh Phi Phi accommodation is primarily based in the north and east of the island at Laem Tong and Loh Bagao Beaches. The Zeavola Phi Phi Resort, Holiday Inn Phi Phi Island and Phi Phi Island Village Resort And Spa. They command the finest reviews of all the quality places to stay and have superb villa accommodation and beachfront suites. The 3 star Koh Phi Phi accommodation and the quality rooms in the 2 star accommodation are often locally or family run resort on the beachfront. These resorts are great value but time is needed to go through their reviews to get the type of ambiance you need. They vary a great deal in facilities of room, resort and service. The Phi Phi Hotel group has some excellent mid-range hotels that are in-land and are good value. The PP Palmtree Resort, Phi Phi Banyan Villa and Phi Phi Hotel are well priced and well-reviewed. These resorts do not charge for the New Year Eve and Christmas Eve banquets that other resorts have a tendency to do. See the link Mid-range Phi Phi accommodation. 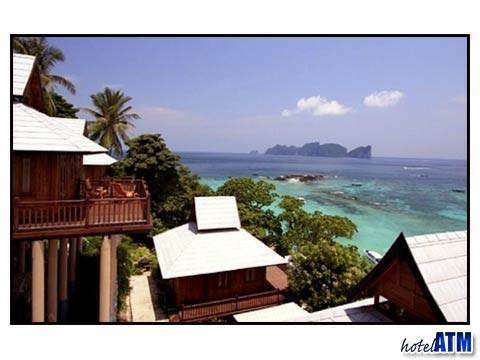 There is a large amount of budget Koh Phi Phi accommodation in the main Phi Phi Don Village. These are guesthouses and hostels near the pier like the Ivory Phi Phi and those bungalows and guesthouses on the outskirts of the village under the mountains like the Tropical Garden Bungalows. This accommodation is ideal for those looking for the cheapest accommodation on the island. Koh Phi Phi accommodation cheap deals for Free Night Specials, Fixed Night Promotions, Special Discounts, Early Bird Offers Honeymoon offers can be found here; Phi Phi Hotel Deals. On top of these this website offers it's own unique one night free for any stays over 15 nights. There are many ways to knock upto 70% of high and peak season prices by visiting Ko Phi Phi hotel deals.